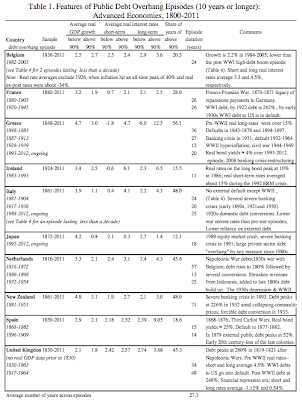 The World's Debt Crisis: How Long and How Hard? 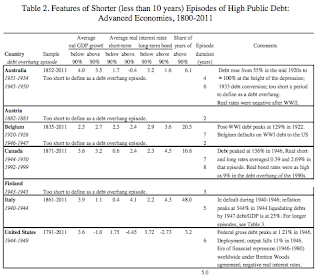 Interesting research by Kenneth Rogoff, Carmen Reinhart and Vincent Reinhart takes a look at 200 years of public debt overhang episodes where public debt-to-GDP levels exceed 90 percent for at least five years. 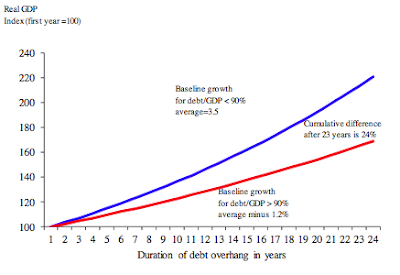 In the paper entitled "Debt Overhangs: Past and Present", released in the spring of 2012, the authors look at the impact of high public debt on economic growth and interest rates and how long these excessive debt episodes last. Here is a summary of their findings. 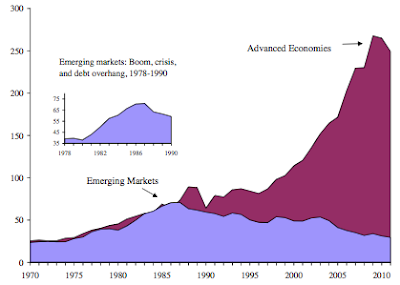 Notice that, since the middle of the first decade of the new millennium, the debt transgressors that consisted of the emerging markets in the 1980s and 1990s have been replaced (and rather rapidly so) by the debt "sins" of the world's advanced economies. The debt of the emerging market nations has fallen from a high of just under 100 percent of GDP to its current level of just over 40 percent whereas the debt of the world's advanced economies has done exactly the opposite, rising at an exponential rate. The authors project that the 22 nations of the advanced economies are now experiencing a public debt overhang as their average debt exceeds the 90 percent of GDP hurdle. You will also notice that the advanced economies had a debt peak in the 1940s; this was a result of massive spending on World War II. 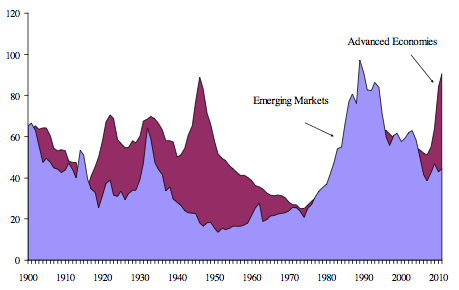 A somewhat lower peak developed for the world's emerging countries during the early 1930s as a result of spending during the Great Depression. 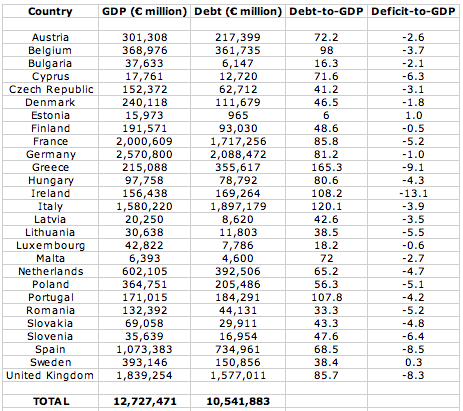 Out of the EU27, five nations have a debt overhang and the major economies of France, Germany and the United Kingdom are well on their way to reaching the 90 percent level. Looking further afield, two of the world's largest economies, Japan and the United States, also have debt-to-GDP levels that exceed the 90 percent mark with Japan hitting just under 200 percent and the United States passing the 100 percent mark earlier this year. The total debt of the 22 advanced economies is 250 percent of GDP, nearly 10 times the total debt-to-GDP for the 25 nations of the emerging economies. That is nothing but amazing and is a bit counter-intuitive to what many people would expect. 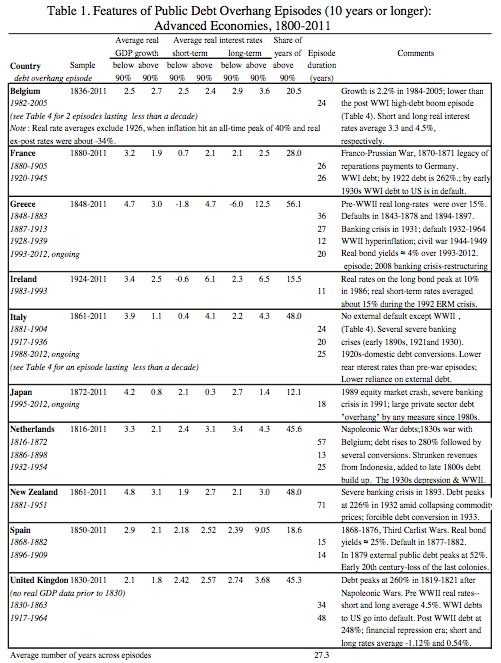 Greece is the worst offender of the 13 lengthy overhang nations with four episodes of very high debt-to-GDP since 1848, covering a total of 95 years out of the 163 year sample (58 percent of the time). Italy has four episodes since 1861 (one is less than 10 years in length) covering at total of 74 years out of the 150 years (49 percent of the time). 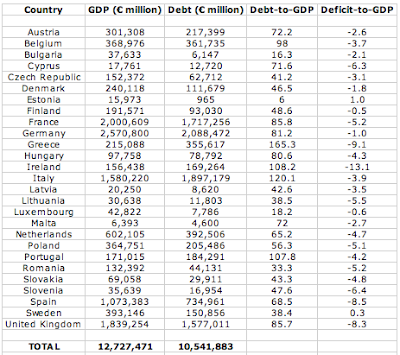 All told, for the 10 nations with long debt overhangs, the average length of the overhang is a stunning 27.3 years! For the entire sample of all nations including those with shorter duration overhangs, the average period of high debt levels is a still amazing 23 years. Now that we've established that the world's largest economies are in a debt overhang position as defined by the authors of the paper and that these debt overhangs can last for decades, what are the repercussions? We wonder why our economies just don’t seem to be firing on all cylinders since the Great Recession, don’t we? Perhaps all of that stimulus did exactly what governments didn’t expect! To put the 1.2 percent per annum drop into a long-term perspective, over the 23 year period (the average of debt overhangs as noted above), total real economic growth loss is 24 percent. 2.) Interest Rates: It is generally thought that as debt rises, the interest rate premium on that debt rises as well, since the risk on each nation's debt securities rises. 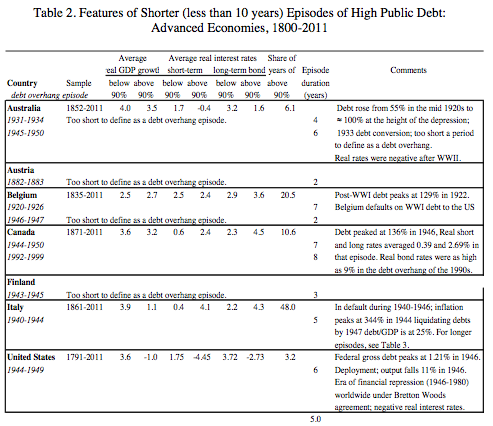 In this study, of the 26 episodes of high debt, 15 periods had higher real interest rates and a not insignificant 11 episodes actually had lower real interest rates. Interestingly enough, four of the 26 episodes had both low interest real interest rates and lower economic growth, a seeming contradiction to what we would normally expect. In summary, the world is facing a debt hurdle that may last far, far longer than we would expect. When we read headlines in the mainstream media that predict that Europe's debt problems appear to be solved, we should not be terribly surprised when a new issue seems to appear out of nowhere. After all, when compared to precedents set over the past two centuries, the world's current public debt crisis appears to be in its infancy. What will be telling is to see whether the world's debt markets can continue to absorb the massive amounts of new sovereign debt that will be required to keep the world's economy turning. Earlier, I was the one that wrote that the US economy is slow because it's supposed to be. It's economy survived on debt and, as such, it'll take a long time to recover from that even if you do everything right. It's not much different from a household that decides to stop using credit cards after running a 50,000 bill. They will have to live, not 'within their means' but well below their means until that debt is paid. It looks like we'll be all doing the same thing, for a few decades. New world order happening. The whole thing is a big scam to take over sovereign control over European countries. This whole debt issue is by design, that's all period! Your articles are excellent! But I have a hard time reading some of the charts. I think the problem is low resolution of the images. Of course you always provide the source of the charts, but still. Yes, thank you for the article. But I suffer from the same problem as Walter. Is there any way we can get the charts more clearly? Why has Japan not yet started to emerge from its overhang? It must have lastet more than the average time by now. The Longest Unemployment: Where Is Mr. Bernanke? What Was Mitt Romney Worth in 2011?